TopHatKat: Kate Spade "What's In Your Bag?" Kate Spade, originally uploaded by TopHatKat86. A popular trend on a couple websites right now is, "What's in your bag?" So, I decided to 'bite the bullet' and try it out. Flickr has a whole group dedicated to the subject. I browsed the group before adding my own submission. 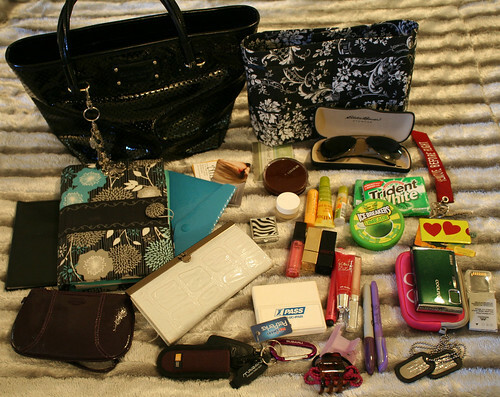 There are so many different things that people carry in their bags! The most common item I noticed was an mp3 player, more specifically an iPod. Many people are also carrying around cell phones, cameras, and computers. Some of the more unique items some people are carrying in their bags range from toothbrushes to kitchen knives (yes, someone actually posted a picture that states they carry a butcher knife around in their bag). Many people carry around hand sanitizer and lotion, two items that are currently NOT in my bag, but will soon be. I am they only one who I saw that carries around an ipass? Interesting. I do enjoy being different. Also, I didn't notice anyone also, so far, that has a separate organizer for their receipts? Guess I am special there too. I also just noticed that I have a fairly well done color scheme going in my bag, surprisingly not done on purpose.